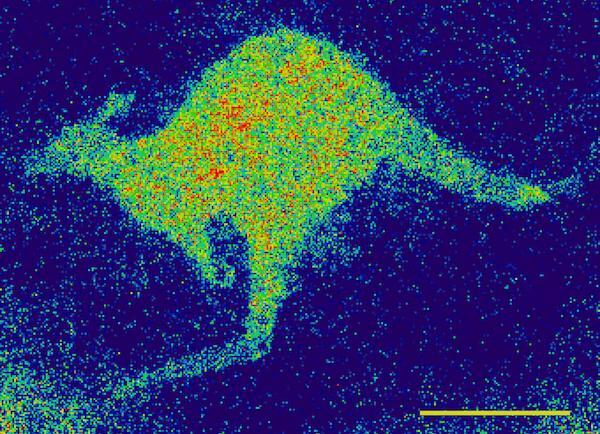 In a new paper published today in Nature Communications, a team of researchers at the University of Melbourne reveal a "quantum kangaroo" that demonstrates a way to detect and image electronic spins non-invasively with ambient sensitivities and resolution orders of magnitude never before achieved. The breakthrough will provide physicians and researchers with a new tool for probing the role transition metal ions play in biology and disease. Electron spin resonance (ESR) techniques have been a mainstay in understanding biochemical processes in biological systems. Yet ESR has not seen the rapid growth compared to its sister technology, nuclear magnetic resonance, which is now a mature technology used in magnetic resonance imaging (MRI) to look inside the body. Both ESR and NMR apply a magnetic field to image molecules, but unlike NMR, ESR can reveal biochemistry related to metal ions and free radicals. The challenge is that in biological systems the detectable concentration of electron spins is many orders of magnitude lower than nuclear spins. Hence, the roadblock for the development of ESR-based imaging techniques has been the sensitivity required – typically billions of electronic spins have been needed to generate a sufficient signal for successful imaging. Enter: quantum technology. A team led by Professor Lloyd Hollenberg has used a specially engineered array of quantum probes in diamond to demonstrate non-invasive ESR imaging with sub-cellular resolution. Remarkably, the system is able to image and interrogate very small regions containing only a few thousand electron spins. "The sensing and imaging technology we are developing enables us to view life in completely new ways, with greater sensitivity and resolution derived from the fundamental interactions of sample and probe at the quantum mechanical level," said Hollenberg, who is Deputy Director of the Centre for Quantum Computation and Communication Technology (CQC2T) and Thomas Baker Chair at the University of Melbourne. "This dramatic improvement in ESR imaging technology is an exciting development and a clear demonstration of how quantum technology can be used to enhance signal sensitivity and provide solutions to long standing problems, for example probing human biochemistry at even finer scales." Scaling ESR technology down to sub-micron resolution has been challenging because such a reduction in spatial resolution requires substantially better sensitivity. However, this is precisely what quantum probes offer – high sensitivity with high spatial resolution. By generating an array of quantum probes in diamond, using the material's unique nitrogen-vacancy colour centre, the interdisciplinary research team was able to image and detect electronic spin species at the diffraction limit of light, 300 nanometres. Critically, the sensing technology is able to provide spectroscopic information on the particular source of electronic spins being imaged. Dr David Simpson, lead author and co-head of sensing and imaging at the Centre for Neural Engineering said that the technology can provide new insight into the role transition metal ions play in biology. "Transition metal ions are implicated in several neuro-degenerative diseases, however, little is known about their concentration and oxidation state within living cells," he said. "We aim to adapt this new form of sensing to begin probing such effects in a range of biological systems." One of the unique advantages of quantum-based sensing is that it does not interfere with the sample being imaged. Other approaches rely on fluorescent molecules binding to particular targets of interest. While these approaches are species-specific, they modify the functionality and availability of the target species being imaged. PhD student and co-author on the paper Robert Ryan explained the technique. "Our technique relies on passive, non-invasive detection of electronic spins by observing their interaction with the quantum probe array," said Ryan. "By carefully tuning an external magnet into resonance with the quantum probes, we are able to listen to the magnetic noise created by the sample's electronic spins. Different electronic spin species have different resonance conditions; therefore we are able to detect and image various electronic spin targets." A key to the success of the work was collaboration among the team members, who were drawn from different research centres across the university. "The interdisciplinary aspect of this research helped push the boundaries of what is possible," said Professor Paul Mulvaney, co-author and Director of the Centre for Exciton Science in the School of Chemistry at the University of Melbourne. "From a chemistry perspective, it is surprising to see that a fragile quantum system can accommodate the fluctuating environment encountered in ?real' chemical systems and the inherent fluctuations in the environment of ions undergoing ligand rearrangement. The complementary expertise within chemistry, physics and neuroscience has led to this advance."